Your cat might not be as fond of your samoyed as you are. Samoyeds have strong instincts to hunt and herd. As a result, they often enjoy chasing cats and other small animals. If you want to live with both a samoyed and a cat, the dog will probably require training and supervision. The samoyed breed developed as a working dog in Siberia, and herding reindeer numbered among its tasks. Today’s samoyeds love running after smaller animals, including cats. Because of their instinct to chase, they should never be allowed off-leash, and during walks you might have to resist being dragged in your dog’s wake as he charges after a chipmunk or rabbit. Your samoyed also could be capable of bothering and even harming your cat, unless you provide adequate training and supervision. Samoyed puppies who grow up with cats often learn to coexist well with their feline counterparts. 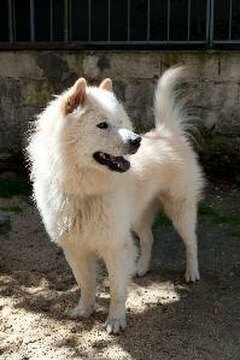 You may need to provide some guidance as the dog grows, however, because samoyeds often don't know their own strength and may play too roughly. If you want to add a samoyed or a cat to a home where the other one already lives, introduce them carefully, over a period of days and under close supervision. If you see any signs of aggression or discomfort from either, separate them and try reintroducing them again later. Samoyeds become extremely destructive when they’re bored. They look for other ways to entertain themselves, including pestering your cat. You can help head off problems by making sure your samoyed gets exercise every day and by keeping him mentally stimulated; teach him new tricks or attend a training class with him. Closely supervise the animals when you’re home, and when you’re gone, avoid leaving your samoyed alone with the cat. Enclosing them securely in separate rooms greatly diminishes the chance of a conflict. Make sure the dog understands you want him to get along with the cat. Samoyeds are eager to please, and they’re smart and sensitive enough to know when their people are upset by their behavior. Samoyeds love being part of a pack or family and dislike being alone. They’re very affectionate and usually get along well with children, as long as the kids treat them with respect. Again, though, the dog may be unaware of how much stronger she is, so you should always supervise her when she’s around children. Samoyeds can be trained to live with smaller pets, such as rabbits or ferrets, but as with cats, you shouldn’t ever leave them unsupervised. Because of their pack orientation, samoyeds often live particularly well with other dogs. Why Do Cats Torture Mice? Does the Shiba Inu Get Along With Cats?